Portfolio page featuring a classroom dsiplaying student artwork such as rugs, paintings, pottery, basket weaving with three students. One student is reading, the other two are playing piano. All three are wearing white dresses. There are two oriental rugs on the floor. 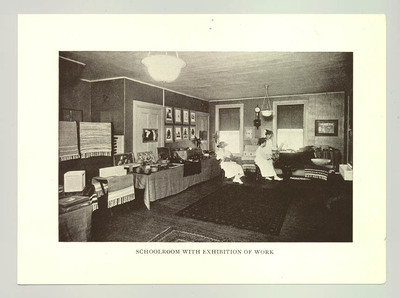 Written in border; Schoolroom with Exhibition of Work.